Benjamin was a fisherman. According to the 1841 census he was 68 (ages not rounded down by that enumerator) so born about 1773, but not in Kent! His age at death in 1848 was said to be 80, but that was quite likely a guess. Benjamin son of Thomas and Mary Saunders which is very likely him. Thomas Saunders and Mary Roberts were married 16 January 1772 at St Giles in the Fields, Holborn. Both were of that parish. Benjamin's first marriage was at Swanscombe in October 1798 to Ann Durling. 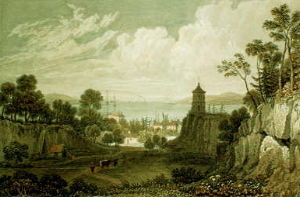 He and Ann lived in Greenhithe, the northern part of the ancient parish of Swanscombe, and they had two children baptised in Swanscombe before Ann's death in December 1802. Nine years later in October 1811 he married Lydia Couchman daughter of William and Frances COUCHMAN at Milton-next-Gravesend. For the next few years Benjamin and Lydia lived in Greenhithe where they had the first of their six children baptised but then moved to Gravesend where the younger children were baptized. The Swanscombe area is now part of the Thames Gateway and would be totally unrecognised by them, with the Blue Water shopping complex, the M25, Dartford Tunnel & QE2 Bridge, Ebbsfleet International railway station and Darent Valley Hospital all within easy (19th century) walking distance. Greenhithe as Benjamin and Ann would have known it; looking north towards the River Thames. In Gravesend the family lived in West Street, which runs parallel to the River Thames and houses on the northern side of the road would have had direct access to the river, though I don't know on which side of the road they lived. In 1841 Benjamin was living in nearby John Place with his daughter Elizabeth who was described as a (fishing) net maker. Two views of Gravesend from the river, as Benjamin would have known it, and showing how much the area changed in a short time. 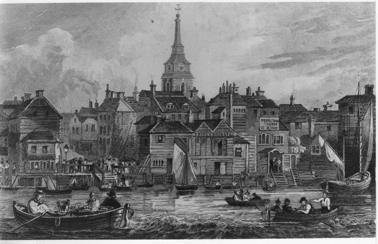 The 1828 engraving shows the bottom of High Street and several buildings in West Street, with St George's church behind. 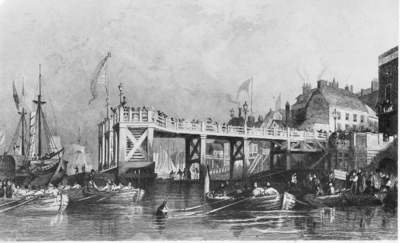 The building on the left of the 1828 engraving is the same one that's on the right in the 1833 picture, but the buildings in the centre of the 1828 view have been replaced by the Pier Hotel in the later picture.The first (wooden) Town Pier was badly damaged by rioting watermen who feared for their livelihoods and was replaced in 1836 by what is now the oldest cast iron pier in the world although the surrounding area has changed considerably with late 20th century redevelopment. Lydia died in October 1833 and is buried at St George's Gravesend. Benjamin died in November 1848 at Denton but he too is buried at Gravesend, St George. Adam Thomas bap July 1813, Swanscombe, bur Sep 1833 Gravesend.